'TREE-mendous' was the verdict on the fifth annual Glenreagh Timber Festival from one of its organisers, Peter Dickson-Smith. He said there was a huge crowd for Saturday's timber festival, with numbers estimated at up to 2500, while yesterday's village events were also popular. 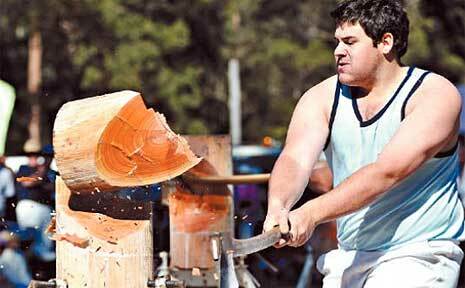 The feature event of the busy woodchopping program was the State of Origin Relay with NSW taking the guernsey from Queensland. The victorious NSW team was Peter, John and Dan Shipman, all of Glenreagh, Michael Kellett of Dorrigo, Ken Harris of Tea Gardens and Jason Gill of Glen Innes. Sherwood Cliffs Christian Community carried off two prizes at yesterday's street procession.